The expanse of clear, blue water. The wide-open skies. 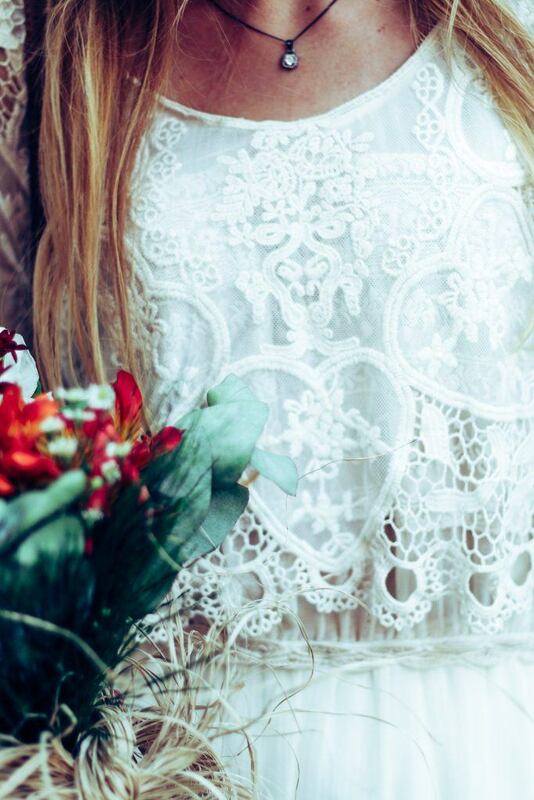 And getting to shop for beach wedding dresses to perfectly compliment a rugged-yet-elegant lakefront event. 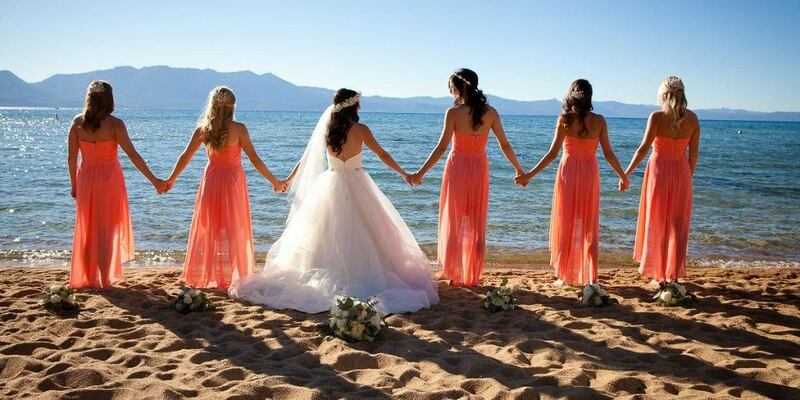 That pretty much sums up why we all love Lake Tahoe beach weddings. 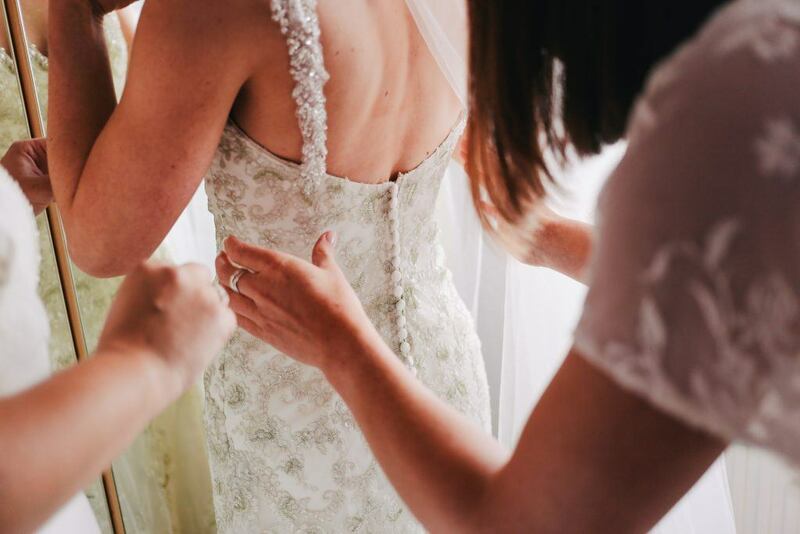 Read on to learn more about some of the best beach wedding venues at the lake, and check out a few gorgeous beach wedding dresses we thought would work just right. If you’ve always dreamed of a sunset wedding, a ceremony at Edgewood Tahoe is your dream come true. Said to be one of the most incredible lakefront venues in the area, Edgewood offers both beach and lakefront deck weddings that are equally spectacular. No need to worry about photo backdrops at Edgewood. You’re guaranteed to have plenty of stunning photo ops no matter what time of day you schedule your ceremony. The planning team at this luxury boutique hotel is second to none. Whether you have exceptionally elegant or just-right-rustic in mind, The Landing Resort and Spa team will help you create a lakeside ceremony and reception worthy of awards (They’ve actually picked up quite a few of them.). This place specializes in captivating beauty—and not just because it rests on the shore of one of the world’s most spectacular alpine lakes. 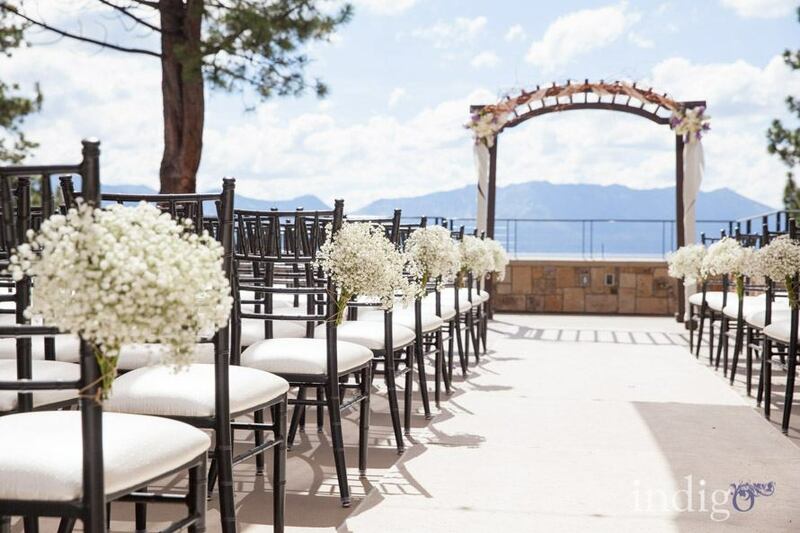 At Beach Retreat and Lodge at Tahoe, your gorgeous beach wedding is seamlessly transformed into a lakefront reception that your friends and family will never forget—and that you’ll treasure in your heart forever. Going back to the topic of pictures… photographers absolutely love beach weddings at Zephyr Cove Resort. And why wouldn’t they? One look around and you’ll realize there’s no escaping breathtaking views of Lake Tahoe’s turquoise waters and surrounding mountain peaks. Zephyr Cove Resort is the ideal venue if you’re looking for an intimate setting that embraces the outdoors and relaxation. 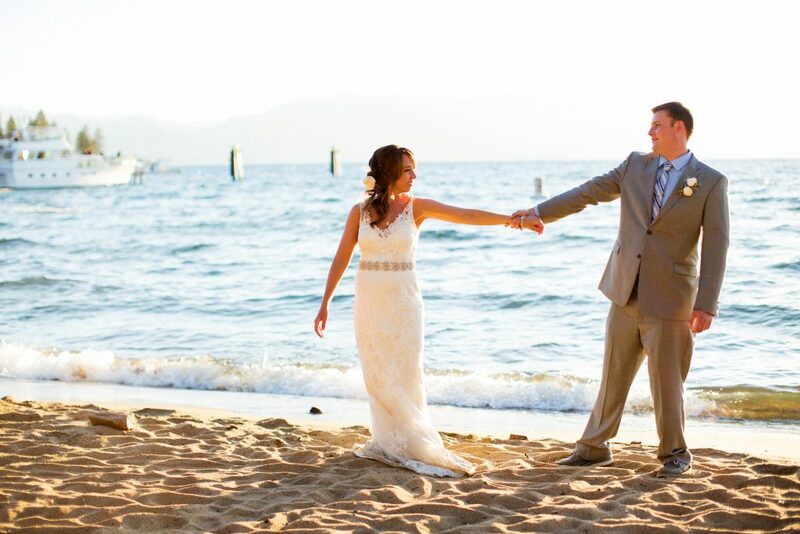 What makes planning a beach wedding at Lake Tahoe Resort Hotel so much fun? The versatility! The team can help you create a lakefront wedding touched by elegance on every side. Or, if you’d rather go with a homey, family-oriented event full of fun and recreation, they’ve got that covered, too. You can let your creativity run wild. 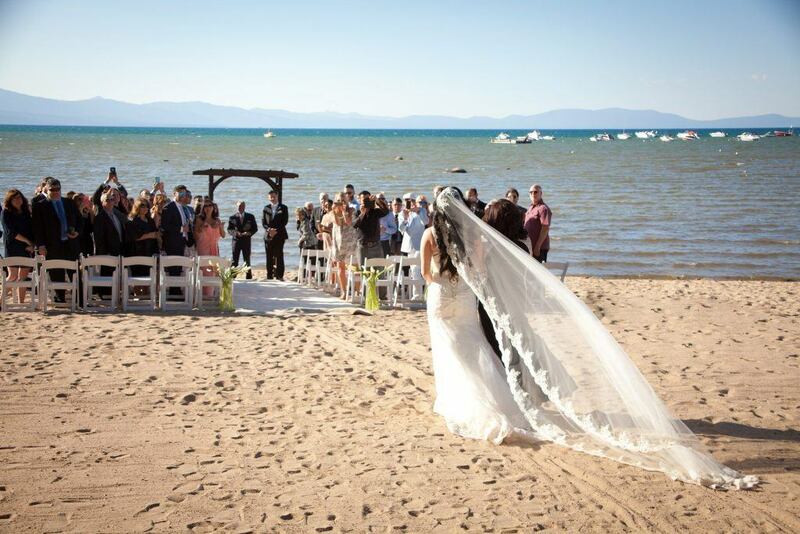 Every one of our award-winning venues, including The Ridge Tahoe and Hard Rock Cafe Tahoe, can help you arrange the beach ceremony of your dreams. For more information, you can also visit the Lake Tahoe Visitors Authority (LTVA) website.